Mar | 2017 | "To the Warrior his Arms"
These are a series of photos from an album I was surprised to discover in a Wellington second-hand shop. The collection spans from 1971 to 1979 and provides a photographic history of the ANZUK Supply Depot (1971-74) and the New Zealand Supply Platoon (1974-89). 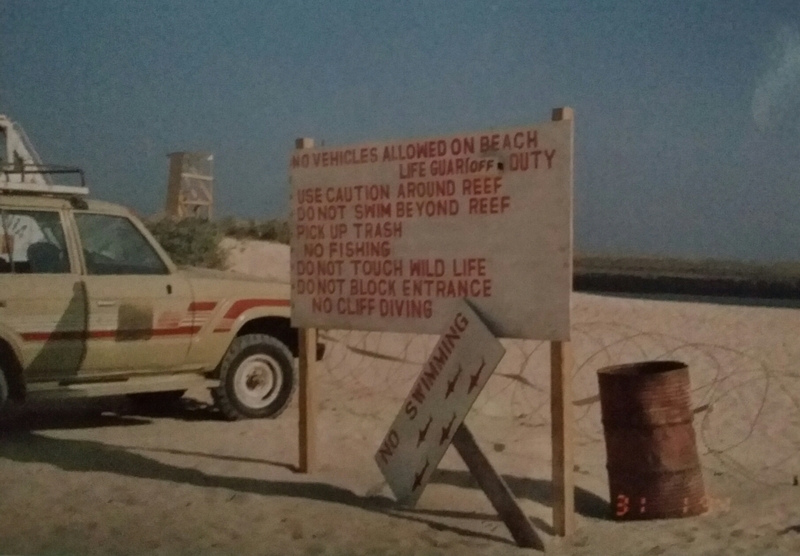 I was surprised to find that I have several connections to these photos. The first link is evident as I served in Singapore from 1987 to 1989 and the Supply Platoon was part of my unit, the New Zealand Advanced Ordnance Depot (NZAOD). I spent a lot of time in the cool-store and the old POL Store which by then was our vehicle section, and sadly one of my last duties was clearing these buildings out for handover to the Singapore Authorities ending around 54 years of commonwealth occupancy. The second connection is from one of the photos of the Royal Fleet Auxiliary (RFA) Tideflow been provisioned. In 1971 a Royal Navy Task-force headed by the carrier HMS Eagle visited Wellington, New Zealand. With My brother home from Cadets, my father took my brothers and me to visit the ships. Finding long ques for all the fighting ships, we wandered around, and somehow we ended up on the RFA Tideflow. Which according to family legend, 5ish year old me got separated from the party and found my way to the wardroom (a habit that has stuck with me for a lifetime) and my brother getting incredibly drunk. As a vicar, my father offered the crew ( who were mainly Maltese) some pastoral care and arranged some onshore activities, including a football match and a home cooked meal at the vicarage. The bonus for us kids was what seemed to be a mountain of crisps, chocolates and canned soft drinks, canned soft drinks been somewhat of a novelty that was unavailable in New Zealand at the time. On departure, my father was given a Plaque as a thank you, and to this day that plaque takes pride of place in his living room, Oh there was also several cases of Courage CSB. 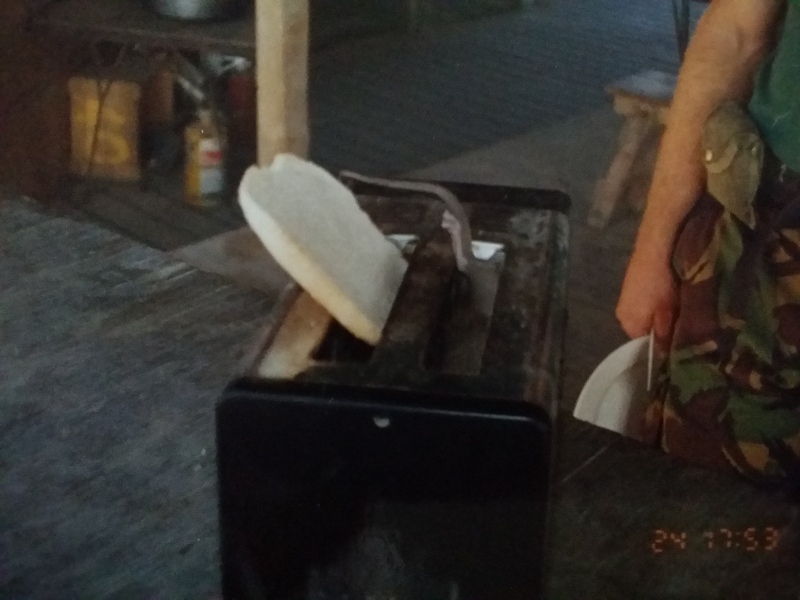 The ANZUK Supply Platoon was the ANZUK unit responsible for the provision of foodstuffs and POL (petrol oil lubricants) to the ANZUK Force (1971-1974). Under the command of the Commander Royal Australian Army Service Corp (CRAASC), it was a tri-nation unit, with members drawn from Australia, New Zealand and the United Kingdom. It was formed at a time when the three different armies were rationalising their Supply functions from an Army Service Corp Responsibility to an Ordnance Corp responsibility, and as a result, the unit was a mix of Royal Army Ordnance Corp and Australian and New Zealand Army Service Corp personnel. The United Kingdom had made the change in 1965, Australia would follow in 1973 and New Zealand in 1979. With the withdrawal of the British and Australians form Singapore, the ANZUK Supply Depot would change ownership and become the NZ Supply depot In 1974, continuing under RNZASC control until 1979 and then RNZAOC control until 1989 when the New Zealand withdrew its forces from Singapore. Located in the northeastern section of the former HM Naval Dockyard, Sembawang, Singapore, the ANZUK Supply Depot occupied the cluster of buildings that were the former Royal Navy Victualling and Storing Office and Victualling Depot (SVSO and Vict Depot). Standing L to R: Cpl Parker, RAASC. Cpl Olderman, RAASC, Cpl Mcintyre, RAOC. Sgt Frank, RAOC. Cpl Rangi, RNZASC. Sgt Locke, RNZASC. Sgt Bust, RAOC. Pte Mag, RAASC. Cpl David, RAASC. 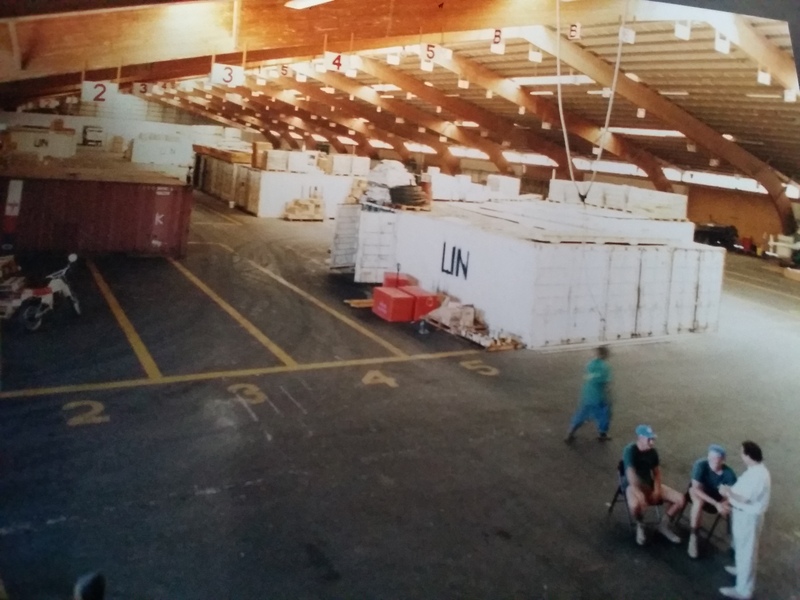 1992 was an exciting time to be an Ordnance Soldier, after close to 20 years with few operational tours; the RNZAOC was deploying a supply unit with supporting elements from the RNZCT, RNZEME, RNZSig, RNZMC and later RNZIR to support the international and United Nations famine relief efforts in Somalia. 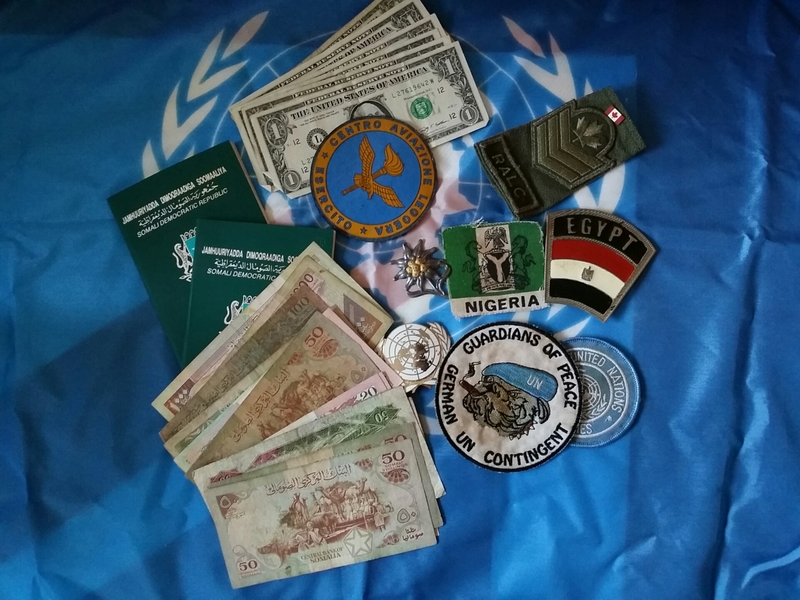 The New Zealand Army first deployed to Somalia in 1992 with a Supply Detachment which was part of the original United Nations Operation in Somalia, (UNOSOM). To facilitate the purchase of goods in neighbouring Kenya, personnel were also deployed there on a regular basis. The original commitment was 28-strong, with most members arriving in Somalia in early 1993. The Supply Detachment was replaced in July 1993 with a more substantial 43-strong Supply Platoon. Due to the deteriorating security situation, it included an infantry section from 1 RNZIR, which marked the first deployment of Kiwi combat troops since the Vietnam War. This Platoon witnessed the Battle of Mogadishu unfold including the events of the infamous Black Hawk Down incident. A second Supply Platoon rotated in January 1994. This platoon was present for the draw-down and withdrawal of all of the western forces which were completed by 30 March 1994, which then left the New Zealand platoon, Australian MOVCON, Air Traffic Controllers and ASASR troop and the Irish Transport Company as the few western contingents remaining in Somalia. The purpose of the New Zealand Supply units was the provision of supplies to the UN Force. To facilitate this, a section was situated at the Port of Mogadishu working with the Catering, and food supply contractor to the UN, Morris Catering, and a section was located at the Airport where a warehouse was maintained holding general stores. The New Zealand troops were poorly equipped and only issued with primary small arms and fragmentation vests, which given the threat level was wholly inadequate for the task. Vehicle movement was by light-skinned commercial vehicles and due to the risk of ambush and IEDs, with vehicle movement often limited, and often the situation deteriorated to a state where vehicle movement was stopped altogether, and helicopters had to be used to fly to United Nations locations around Mogadishu. Gunfire was constant, with Somali bandits climbing into the surrounding buildings and sporadically firing into the airfield and seaport, with random mortar fire also been a continuous threat and annoyance. An increasing casualty list of UN personnel and relief workers served as a continuing reminder of the hostility and dangers of working in Somalia. The New Zealanders, he said, worked long hours, often ten hours a day, seven days a week. In one month alone more than 1000 tonnes of rations were distributed, including live goats. 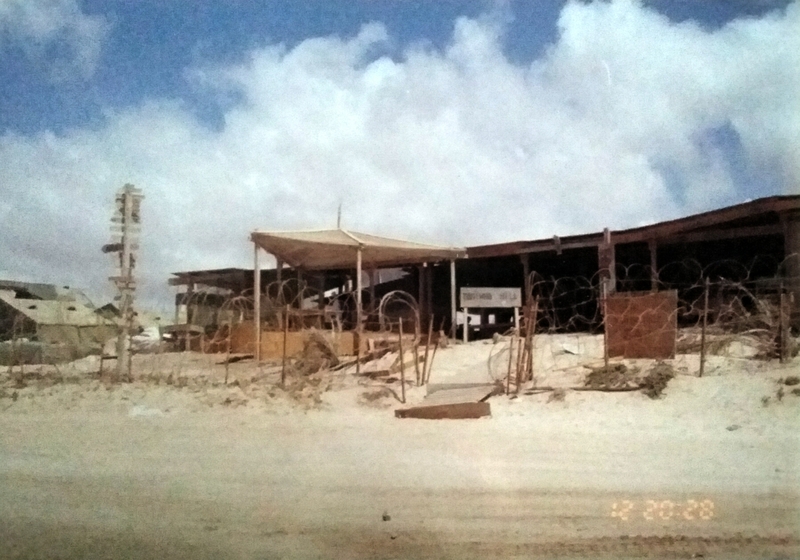 The New Zealanders home in Mogadishu was a camp in the sand-hills between the Indian ocean and Mogadishu Airport which had been christened “Taniwha Hill”. 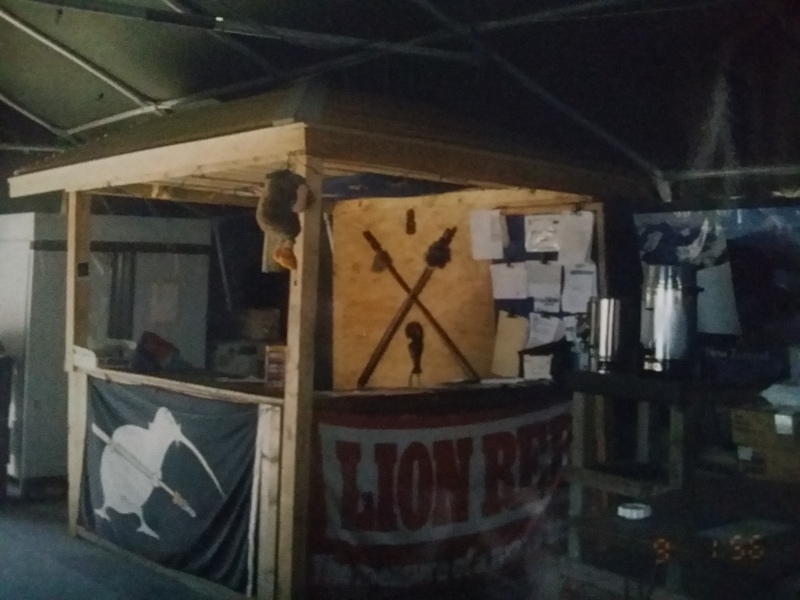 Taniwha Hill was a self-contained location with heavily sandbagged tents providing the most austere accommodation, and a large mess tent/kitchen/recreation area as the central point of the camp. Ablution facilities were rudimentary with buckets for showers and dissected 44-gallon drums for toilets, which required the daily disposal by stirring and burning. Modern ablution blocks with hot and cold running water and flush toilets were provided in the last weeks of the deployment. The Supply Platoons ended their mission in June 1994. A very successful reunion was held in 2013, with past members returning from as far away as the UK to attend, A very successful take away from this reunion was a Somalia Journal which no doubt takes pride of place on many bookshelves. The next reunion is planned for 2018. The Kiwi Somalia veterans have an active Facebook Group, Taniwha Hill – Kiwi Somalia Veterans where members keep in touch, share photos and organise events. Before the 1st World War, there was no Ordnance Organisation in the New Zealand Army, responsibility for Ordnance Services were split between the Defence Stores Department, a civilian organisation and the Royal New Zealand Artillery. Need for an Ordnance Organisation has been identified as early as 1901  and again in 1907 , but it wasn’t until 1917 that a formal Ordnance organisation would be established in New Zealand. Based on the British Ordnance model (which itself was abolished on 28 November 1918 with the formation of the RAOC)  , two separate organisations would be established for the supply, maintenance and repair of equipment, small arms and all stores required for the Defence Force. The regulations establishing the New Zealand Army Ordnance Corps (NZAOC) were published in the New Zealand Gazette on the 7th of June 1917. Established under the authority of the Defence Act,1909 the NZAOC was constituted and created as part of the Permanent Staff of the Defence Forces of New Zealand as of the 1st of February 1917. Superseding the New Zealand Defence Stores Department, absorbing its existing staff and those handling military equipment and stores in the districts and training camps. Previously the Defence Stores Department had been under the control of the Public Service Commission, the NZAOC was now under the direction of the Quartermaster General. The establishment of the new Ordnance organisations, ended the anomaly of having civilians in the army who are outside it, and were not subject to military discipline and control, and placed staff who had worn civilian clothes into uniform and under army discipline  . The Gazetted regulations that established the NZAOC laid out the foundation of the Corps, the same Gazette also detailed the establishment of the New Zealand Army Ordnance Department, which was a separate organisation made up only of Officers. To complement the creation of the new Ordnance Services, new regulations for the management of the equipment of the New Zealand Military Forces were published in the New Zealand Gazette on the 14th of June 1917 . The NZAOC in conjunction with the NZAOD in New Zealand and the NZEF NZAOC would continue to support New Zealand’s war effort up to the end of the war, and then play a significant role in the demobilisation of New Zealand’s Forces, and the return, inspection, repair and redistribution of equipment. As the NZEF demobilised, the NZAOC absorbed some of the men who had served with the NZEF NZAOC providing much operation experience which became invaluable as both the NZAOD and NZAOC consolidated their position and started to centralise themselves as an organisation in Trentham, Burnham and Auckland. Badges of the NZAOC are covered in detail at Ordnance Badges of New Zealand 1916-1996. On 27th of June 1924, the regulations establishing the NZAOD and NZAOC on the 7th of June 1917 were revoked, and the NZAOD was reconstituted as part of the New Zealand Army Ordnance Corps resulting in one Ordnance organisation for the New Zealand Permanent Forces . J. Babington, “Defence Forces of New Zealand,” House of Representatives, Wellington, 1904. J. Ward, “Defence Forces of New Zealand,” House of Representatives, Wellington, 1907. F. Steer, To The Warrior his Arms, Barnsley: Pen and Sword Books, 2005. A. Fernyhough, A short history of the RAOC, London: C B Printers Ltd, 1965. J. Bolton, A History of the RNZAOC, Wellington: RNZAOC, 1992. “Defence Stores,” Otago Daily Times, no. 17033, p. 6, 18 June 1917. New Zealand Gazette, p. 2292, 7 June 1917. “Regulations for the Equipment of the New Zealand Military Forces,” New Zealand Gazette, no. 99, pp. 2369-2498, 14 June 1917. “NZAOD and NZAOC,” New Zealand Gazette, p. 1605, 3 July 1924. “New Zealand Army,” Evening Post, vol. XCIV, no. 24, p. 7, 28 July 1917. “Ordnance Services,” Evening Post, vol. XCIX, no. 38, p. 5, 14 February February 1920. Before the 1st World War, there was no single Organisation responsible for the provision of Ordnance Services to the New Zealand Forces. Responsibility for Ordnance Services was split between the Defence Stores Department, a civilian organisation and the Royal New Zealand Artillery. Need for an Ordnance Organisation has been identified much in the preceding years including as early as 1901  and again in 1907 , but it wasn’t until 1917 that a formal Ordnance organisation would be established in New Zealand. The regulations establishing the New Zealand Army Ordnance Department (NZAOD) were published in the New Zealand Gazette on the 7th of June 1917. Established under the authority of the Defence Act,1909 the NZAOD was constituted and established as part of the Permanent Staff of the Defence Forces of New Zealand as of the 1st of February 1917. Superseding the New Zealand Defence Stores Department, absorbing its existing staff and those handling military equipment and stores in the districts and training camps. Previously the Defence Stores Department had been under the control of the Public Service Commission, the NZAOD was now under the direction of the Quartermaster General. The establishment of the new Ordnance organisations, ended the anomaly of having civilians in the army who are outside it, and were not subject to military discipline and control, and placed staff who had worn civilian clothes into uniform and under army discipline  . Two Ordnance Officers of the expeditionary force camps. Three Accounting Officers at/headquarters, graded as Ordnance officers, fourth class. The Inspector, Engineer, Electric light and Defence vessels stores, graded as Ordnance officer, third class. Ordnance officer First class: – Colonel, Lieutenant Colonel, or Major. Ordnance officer Second class: – Major or Captain. Ordnance officer Third class: – Captain. Ordnance officer Fourth class: – Lieutenant. Honorary Captain O.F. M’Guigan – Ordnance Officer Dunedin, graded as Ordnance Officer, 4th class, but retained the rank of Captain (temp) whilst performing the duties’ of Ordnance Officer, 3rd class. Honorary Lieutenant A.W Baldwin – graded as Ordnance Officer, 4th class, with the rank of lieutenant. Honorary Lieutenant and Quartermaster G.J. Parrell – Inspector Engineer, Electrical light and Defence Vessels Stores, graded as Ordnance Officer 3rd class, with the rank of captain. Captain Arthur Duvall – Proof Officer, Small Arms Ammunition as Ordnance Officer 3rd Class (From 10 January 1918). The NZAOD in conjunction with the NZAOC in New Zealand and the NZEF NZAOC in Europe would continue to support New Zealand’s war effort up to the end of the war, and then play a significant role in the demobilisation of the NZEF and the return, inspection, repair and redistribution of equipment. On 14 February 1920 Lieutenant Colonel H. E. Pilkington, was appointed Staff Officer for the Ordnance Services effectively replacing McCristell as the Director of Equipment and Ordnance Stores, with the new title Director of Ordnance Stores . As the NZEF demobilised, the NZAOD absorbed some of the officers who had served with the NZEF NZAOC providing much operation experience which became invaluable as both the NZAOD and NZAOC consolidated their position and started to centralise themselves as an organisation in Trentham, Burnham and Auckland. Badges of the NZAOD are detailed in my earlier Blog Ordnance Badges of New Zealand 1916-1996. On 27th of June 1924, the regulations establishing the NZAOD on the 7th of June 1917 were revoked, and the New Zealand Army Ordnance Department was reconstituted as part of the New Zealand Army Ordnance Corps resulting in one Ordnance organisation for the New Zealand Army . On joining the RNZAOC in the early 1980’s, significant time was spent on learning about Mr Henry Tucker (1793 – 26 August 1850) who was a Royal Navy officer and the first colonial storekeeper for the newly established Colony of New Zealand. At the time there were really few details about this gentleman apart from the fact he was the Colonial Storekeeper in the 1840’s. Tucker entered Royal Navy service at the Plymouth Yard on 29 November 1802, initially as a Shipwright apprentice under the Master Measurer. Tucker completed his apprenticeship on 14 December 1811, when he then became the Clerk to the Master Measurer, remaining in this role until 1822. This was a role of some responsibility requiring above average literacy and numeracy skills and would have provided Tucker with intimate knowledge of the behind the scenes logistic workings of the Royal Navy. On 16 Nov 1817 Tucker Married Elizabeth Howell (1795-1844) at South Wraxall, Wiltshire, England. It is known that their union produced a daughter Emma Mary who was born in 1829 and a son, William, who was born on 5 January 1843. His wife Elizabeth died on 16 December 1844, and Tucker remarried on 20 December 1845 to Emily Shell. Tuckers Son William would become a farmer, soldier, politician and mayor of Gisborne. With a wife to support, Tucker must have decided that a career as a Purser would be a profitable and logical path of advancement. At that time Pursers were warranted by the Admiralty but did not require professional qualifications. However, some financial surety was needed, 20 years as Clerk to a Master Measurer provided that. The duties of a Purser were to oversee supply and issue of victuals, slops and other consumables. The Purser was one of the five standing officers of the ship. (A standing officer was permanently assigned to a vessel.) The Purser’s position presented many opportunities to the canny to enrich himself, often at the expense of the crew. William Bligh of HMS Bounty Fame, served as his own Purser, with the actual work falling to his clerk. The regulations of the Royal Navy demanded that individuals aspiring to become pursers serve at least one year as a captain’s clerk, which Tucker competed on HMS Calliope, and in 1825 he obtained his promotion to the rank of Purser and Paymaster. In 1828 Tucker was the Purser aboard HMS Icarus, an 18-gun brig-sloop which was then part of the Royal Navy Barbados Station in the Caribbean, undertaking anti-piracy and anti-slavery patrols. In 1840 Tucker was the Purser, and Paymaster on HMS Buffalo, which while anchored in Mercury Bay off Whitianga, loaded with Kauri spars was wrecked in a storm on 28 July 1840. Given the remoteness on New Zealand at that time, Tucker was, along with the rest of the crew of HMS Buffalo stranded in New Zealand, with the choice to either settle or find passage on the next available ship out. In 1840 New Zealand became a Crown Colony separate from New South Wales. William Hobson the incoming governor, having met Tucker on the outwards journey from England to Australia, requested that Tucker remain in the colony and to undertake the office of the colonial storekeeper. To this Tucker consented, occupying that position from 19 Dec 1840 to 1844 when the post of Colonial Storekeeper was cancelled. In the new colony, the role of colonial storekeeper was a critical position within the quickly expanding colonial administration. The colonial storekeeper’s responsibility was to support the colonial administration with its logistical needs. Imperial troops in New Zealand were the responsibility of the Board of Ordnance, with who no doubt Tucker had a close working relationship. In late 1843 Willoughby Shortland, the Colonial Secretary of New Zealand deemed the position of Colonial Storekeeper as unnecessary, cancelling the position. This was an unpopular move and caused some controversy in the new Colony and was questioned by the newspapers of the day as a very apparent case of nepotism. Tucker was a popular individual in the community and especially in the light that as soon as he was made redundant, a Mr Leach was appointed, under a different job title to the office of Colonial Storekeeper. The duties of the Colonial Storekeeper were in time assumed by the Superintendent of Public Works. No longer Colonial Storekeeper Tucker remained in Government service first as the Chief Clerk Audit from 17 Feb 1844, and on 24 July 1844, Tucker was appointed as the Chief Clerk, Governor’s private affairs. On 8 August 1846, it was announced in the nation’s newspapers that Tucker was to be released from Government service. The newspaper articles of the time assessed that Tucker was a well-respected public servant, and there was some disappointment that he was released from public service. Late in 1846, Tucker returned to England, where he was shortly afterwards appointed Paymaster and Purser of HMS Acheron, a Hermes-class wooden paddle sloop of the Royal Navy. While HMS Acheron was undertaking a coastal survey of New Zealand, ill-health compelled Tucker to relinquish his post aboard this vessel. Years of service had significantly impaired Tucker’s constitution, which rapidly gave way, and for the last, three or four months suffered with fortitude and resignation despite being in great pain and died on 26 August 1850 in Auckland, New Zealand. Having been so recently on active service and a much respected public figure in the Colony, Tucker’s funeral was a marital affair. The coffin, covered with the Union Jack, and surmounted with his hat and sword, carried to the grave by a party of Royal Navy Blue Jackets, landed for that purpose from HMS Fly. The funeral party included his son, the Governor of the New Zealand Colony, senior military officials and a long and highly respectable train of civilians and former shipmates from HMS Buffalo. Tucker is buried at the Symonds Street Cemetery in central Auckland. Sadly, although buried in the Symonds Street Cemetery, Tucker’s tombstone can no longer be found in its original position and has not been seen for some years. As the first colonial storekeeper of New Zealand, Henry Tucker has been adopted as the godfather of the New Zealand Army’s Supply Trades. The former Royal New Zealand Army Ordnance Corps named its unofficial Senior NCO, Warrant Officer and Officer social and professional development club “The Henry Tucker Club” a tradition which has carried over to the Royal New Zealand Army Logistic Regiment. Today his name adorns lecture rooms at the Supply Wing of the NZ Army Trade Training School and is also used as the name of a combined exercise and field phase of the Supply Technician RNZALR, Intermediate and Senior Supply courses. Joseph S. Bolton, A History of the Royal New Zealand Army Ordnance Corps (Wellington: RNZAOC, 1992), 43. “Plymouth Yard, Entry Books of Certificates. 1817–1845,” (The National Archives, 1803). South Wraxall Parish, “Marriage Records. 16 November 1817.,” (1817). Patricia Hargreaves, “Henry Tucker,” https://www.findagrave.com/memorial/157192826. Sheila Robinson, “William Henry Terry Tucker,” in Te Ara – the Encyclopedia of New Zealand (1993). National Museum of the Royal New Zealand Navy, “History of the Warrant Officer Rank,” http://navymuseum.co.nz/history-of-the-warrant-officer-rank/. historical Naval Fiction, “Ranks & Duties in Royal Navy,” https://www.historicnavalfiction.com/general-hnf-info/naval-facts/ranks-duties. Brian Lavery, Nelson’s Navy: The Ships, Men and Organization (Annapolis, Md: aval Institute Press, 1989). National Museum of the Royal Navy, “Naval Ranks,” http://www.nmrn-portsmouth.org.uk/sites/default/files/Naval%20Ranks_0.pdf. P. Owen Wheatley Chas Ingram, Shipwrecks New Zealand Disasters 1795 to 1950. , 2 ed. (Wellington: AH & AW Reed., 1936). Wayne Timmo, “Whitianga’s Hms Buffalo Shipwreck Week Ready for Launch,” Waikato Times, 11 July 2015. Coromandel Life, “The Voyage of the Buffalo,” http://www.coromandellife.co.nz/flipview/winter_2015_V2/files/assets/common/downloads/page0010.pdf. K. A. Simpson, “William Hobson,” in Dictionary of New Zealand Biography (Te Ara – the Encyclopedia of New Zealand, 1990). “Tucker Appointed as Colonial Storekeeper,” New Zealand Gazette and Wellington Spectator, Issue 36,, 19 December 1840. “Symptoms of Reform,” Daily Southern Cross, Volume 1, Issue 29, 4 November 1843. “Editorial,” Nelson Examiner and New Zealand Chronicle Volume 3, Issue 138, 26 October 1844. “Domestic Intelligence,” Daily Southern Cross Volume 1, Issue 36, 23 December 1843. “Government Gazette,” New Zealand Gazette and Wellington Spectator, Volume V, Issue 354, 24 July 1844. “New Appointments,” New Zealand Gazette and Wellington Spectator, Volume IV, Issue 325, 17 Feb 1844. Brian G. van Wyk, “Grave Information Henry Tucker,” https://billiongraves.com/grave/Henry-Tucker/12884193. “Henry Tucker,” Daily Southern Cross, Volume VI, Issue331, 30 August 1850. “Exercise Henry Tucker,” NZ Army News, Issue 452, May 2015 2014.